A recent article in the Arizona Republic highlights the negative impacts to the LDS church of the new Arizona law that steps up enforcement of state immigration lows. Due to the large population of Mormons in AZ (6% of the state are LDS), and the large population of Latinos (1.8 million, including many who are LDS), this issue is one that poses internal conflicts for members. Personally. Many church members are very pro-Latino due to the large population of Hispanic members, the perceived shared family values, and the fact that so many members have served missions to Hispanic countries. Politically. Church members in the U.S. are more predominantly Republican than Democrat (although neither party is directly endorsed by the Church); the political rhetoric of the right-wing lately has swung hard in the direction of anti-immigration (especially illegal immigration) and toward securing the U.S. borders as a measure of national security. Pearce has repeatedly said his efforts to drive illegal immigrants out of Arizona and keep them from coming here is based on the Mormon Church’s 13 Articles of Faith, which includes obeying the law. Nora Castañeda, 46, a naturalized U.S. citizen from Hermosillo, Mexico, who has been a member of the LDS Church for 35 years, said several colleagues confronted her after the law passed. . . She does not believe, however, that Pearce’s anti-illegal-immigrant stance is in line with the Mormon faith, which, in addition to teaching obedience to the law, teaches compassion. “However, Church leaders have urged compassion and careful reflection when addressing immigration issues affecting millions of people,” she said in the e-mail. Generally speaking, I’m against things that are illegal, including illegal immigration. I’m strongly against allowing terrorists into the country through unsecured borders, although this seems to be a more likely threat via airports than people trekking across an inhospitable desert. But there is a risk that should be addressed. However, ejecting non-terrorists doesn’t really further that aim. There are many human rights issues because of illegal immigration, including dangerous human trafficking and the conditions that illegal immigrants endure. Given that, and the inhospitable terrain that illegal immigrants must traverse to get into the U.S., only the most dire of circumstances and personal danger could drive someone to take such a desperate action. It’s easy to be concerned about the human rights issues in our own country, but to overlook what those desperate individuals are fleeing in search of a better situation. My compassion is moved. Generally speaking, I am pro-immigration. 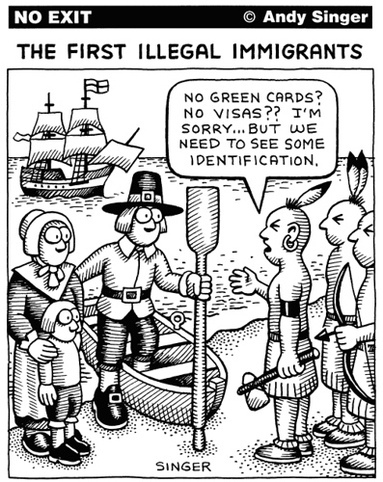 Unless you’re a Native American, it’s a little hypocritical not to be pro-immigration. Immigrants come here full of ideals and dreams and they work their way through the American dream just like our own forebears. They willingly do some of the toughest work, stuff that even laid off Wall Streeters and desk jockeys are unwilling to do. I am decidedly pro-Latino! Latino cultures are family-oriented, loyal, hard-working, and manage to have a lot of fun, too. They have proud traditions just like everyone else, and they have a lot to offer the world. Having served a mission in Spain, I have a lot of love and respect for Hispanic culture. My own solution to the problem is simple: the U.S. should buy Mexico. It’s a win-win! But since that’s not exactly on the table, I suppose I would like to see us come up with a way to secure the borders, a more open legal immigration policy, a pathway to citizenship for those who entered the country illegally, and diplomatic means to assist in improving the circumstances for those living in Mexico. Is the church accountable for the actions of members who are elected officials? I think not, although see my answer to the next question for a caveat. Is this grounds for someone to leave the church in protest? Here I have to say I don’t really think so. The church has not endorsed this position officially; it’s a political matter. But I would say that if local members are behaving in ways that make it difficult for a specific group of people to attend, it’s understandable (yet unfortunate) that they would leave. What does the church do about members who have illegally immigrated? This one’s a bit of a minefield, and my guess is that we have no official stance. Personally, I would be hesitant to link one’s illegal status to matters like TR interviews (e.g. “honest in all your dealings”) when desperation or a desire to protect your family has caused you to flee your dangerous home situation for a better life. I would, in a cowardly manner, propose a “don’t ask; don’t tell” policy for these situations. Let the heads of cabbage and rotten tomatoes fly! Russell Pearce would have turned Brigham Young, Wilford Woodruff and John Taylor over to the authorities for violating the law. 1. Is the church accountable for the actions of members who are elected officials? Only if the church actually directed the elected official to action. 2. Should elected officials who are members be given carte blanche to associate their actions with Mormonism? They should be free to associate their actions to whatever they want. But they, and the church, should accept the consequences wherever they may lie. 3. Is this grounds for someone to leave the church in protest? That can only be answered by the person wishing to leave the church in protest and that person’s relationship with God. 4. What does the church do about members who have illegally immigrated? Currently the church does not report them or make attempts to deport them. In fact, the church sends out illegal immigrants on missions and have them in leadership positions in wards. Hawk, awesome post. Made me think a lot. Here’s some ramblings. I don’t see a politically feasible solution to the problem in our current system of gov’t. I do think it’s a problem (witness high crime rates, largely influenced by latinos, as well as draining the economy), but I’m no fan of deporting people. I’m a big fan of states’ rights, so like Miss Virginia I support AZ (as opposed to the federal gov’t) making the laws, though I don’t necessarily agree with the laws. For me the “right” solution would be to have a limited central gov’t (and hence fairer immigration laws) and allow for easily becoming a citizen. I think this would result in immigrants taking more “ownership” of the country in which they reside, as well as lessening the effect of the dangerous “immigration culture.” If gov’t were limited, handouts would not exist, and taxpayers wouldn’t feel slighted by illegals “mooching on the system.” If gov’t were limited, free markets would reign, and the cost to immigrants of being illegal would likely be too high to make it worth it. Since the culture of latinos is often hard-working, think of the economic productivity and allocation of resources that is being wasted! Perhaps if citizenship were easier to obtain, we could put these people to work legally, build the infrastructure, economy, and allocate the resources accordingly. I don’t believe that latinos are inherently more prone to crime, but that they are likely driven to that. 1. Is the church accountable for the actions of members who are elected officials? No, the church is not accountable for what lay members say. 2. Should elected officials who are members be given carte blanche to associate their actions with Mormonism? Yes, but that doesn’t mean they should or that it is politically wise. I’m not a fan of the church trying to limit what anyone says, even politicians. 3. Is this grounds for someone to leave the church in protest? I suppose it depends on the situation (as you pointed out). But given that the church doesn’t have a position, it seems silly. 4. What does the church do about members who have illegally immigrated? Nothing. It’s not the church’s responsibility to decide whether or not our actions are ethical or moral. If an illegal comes into the TR interview and claims they are honest, then give them the TR. To do otherwise is insulting, demeaning, and not in accordance with what I consider to be the Gospel. Moreover, I would ask what would be the problem? Is the temple work an illegal does (even if they aren’t honest) somehow less valid? In this vein, I’m not sure why we even limit TRs to an exclusive club. Doesn’t make sense to me. Love the post. Points out the obvious conundrum the church and its members are it. I also agree with Hawk that I love the Latino members. In California, I was associated with some of the finest people I have ever known. I had responsibility over a Spanish Branch even though I do not speak Spanish. It was awkward but they always went out of their way to accommodate me. And I also always felt bad about that. Nevertheless, Immigration is a good thing, but it need to be done in the proper and legal way. Most of our families had some members who came over here (all of mine did) but they did so following the rules. The who ha over Arizona is funny and sad. If anyone would read the law, they would see it is nothing more than following the federal law. And I truly believe Arizona did something to get the Feds off their rears to do something. And California boycotting anyone over its laws is a laugh a minute! Now, “Church has not taken a position on immigration.”? Sure, they have. They ignore the issue. Don’t know about now, but a young man or woman here in the US who wanted to serve a mission but did not have documentation, were assigned to a US mission, period. I’ve witnessed it happen several times. So, the leaders know. As for the TR, that is certainly between the member and the Lord and the leader giving the interview. BTW, the interview questions has nothing to do with the value of the Temple work only the worthiness to enter. My first personal experience with this was when I was a bishop in Latin America. A family was traveling to the US on visitor visas only. I counseled them to behave legally. (They retained their business in their home country.) My next contact was a phone call from a counselor in a Utah bishopric who was also an immigrations lawyer helping them to stay in the US. Is the church accountable for the actions of members who are elected officials? No. Should elected officials who are members be given carte blanche to associate their actions with Mormonism? No. No. No. No. No. Is this grounds for someone to leave the church in protest? it depends what “this” is. The fact that the church has a soft position on illegal immigration? Or the fact that there are politicians who trade on their membership in the chuch when it suits them? Neither is worth my membership. What does the church do about members who have illegally immigrated? Here the church position seems to land on the side of compassion rather than rule-keeping, like so many other faiths. At the end of the day, our immigrations issues are driven, it seems, by a federal government that is unwilling or incapable of enforcing the laws on its books, and that also lacks the political will to change those laws. In that environment, it is not surprising that the electorate is frustrated at the resulting confusion. I have mixed feelings when it comes to the issue of immigration. That being said, I think it is reprehensible that this issue has trickled down to our children. How do I know this, because in a recent cartoon, Dora the Explora was portrayed as being Mexican and running across the Arizona border being chased by immigration officials. In another, She was displayed again as a Mexican in a Police Blot with a black eye. I think to take this issue that far is outrageous. The reason your OP is outstanding is because you were a Missionary in Spain (the best of the best). Anyway, millions of people have come to this country and it will not stop. I just believe we need to do something like a guest worker program. People pay someone to help sneak in why not pay the US Government that fee for a permit for 2 years, something like that. That will help with some of the pressure but not all. I think that soon we’ll get some very bad people coming across the border and not for drugs or crime but to do what they do in the Middle East, just a matter of time. I love the Latino people (my family is Latino) and all they bring we just need to get your heads togather and make this work. I don’t like people that use their membership in the church for any reason outside of the normal example or testimony. As far as the TR questions that is hard as if you were hiding some crime or action it wouldn’t be honest same as with those that come here illegally. Bring me your humble and poor with proper papers is the new creed I guess. According to the research of Susan Easton Black, professor at BYU, Joseph Smith’s intention was, if elected President of the United States, to annex Canada and Mexico his first four years in office, then conquer Central and South America his second four years. That might have solved some of our current problems. Is the church accountable for the actions of members who are elected officials? I would say generally no. Should elected officials who are members be given carte blanche to associate their actions with Mormonism? Generally no. Especially when those actions contradict actual church policy. Is this grounds for someone to leave the church in protest? Maybe. The official church is actually pretty liberal on immigration — much more so than its US membership, on average. But with so many members so harshly against illegal immigrants, one could probably reasonably decide that it’s the church’s fault for not teaching the members any better and thus decide not to associate with the LDS church. What does the church do about members who have illegally immigrated? The church clearly considers immigration status in the US irrelevant. It generally ignores immigration status, but it will take active steps to avoid getting someone caught, as Dan mentioned. The church is also behind a loophole in immigration law that exempts churches from employer penalties for using illegal-immigrant volunteers. We underestimate the power of having No Opinion. I’m tired of the media labeling things they don’t like with negative words, ie “anti-immigration bill”. Please. Its not anti-immigrant, its anti-illegal. When I see things like that, I immediately stop listening to what they have to say because its obvious they’re trying to be polarizing and divisive. I am currently working on a video that examines the economic conditions in Mexico, the effects of NAFTA on farmers in Mexico and the U.S. human rights, and immigration from Mexico to the U.S. Among other things. There is a lot to know and a lot to learn on this topic. As a theological or spiritual issues my personal efforts are being directed to raising awareness concerning human rights violations and their direct connection to the legal and policy framework that currently exists in the U.S. and in Mexico. If you think that illegal Immigration is the problem you’re not seeing the big picture. But the best thing you can do to stop it is send your money to mexico in the form of micro loans. Then write your representatives in congress to get NAFTA repealed. I don’t live in Arizona and am not well-versed in what the details of the law are. When I was touring Japan, I was walking to a youth hostel minding my own business and was racially profiled by a neighborhood police officer who asked to see my passport. It was an inconvenience, but I survived. I respected that as a guest of their country, I was subject to their laws. If Arizona is going to try to enforce immigration laws rather than do nothing, then the convenience of some citizens will be eroded as a cost. They say that they can train their police officers to do this without racial profiling. I’m not sure I see how this is done. There will always be allegations of racial profiling even if they follow their policy to the T.
As to the LDS folks, it seems there is a tendency that hearts are softened to the plight of those who are illegal immigrants when they are receptive to the missionaries. Illegal immmigrants pay taxes. Etc. Please dislike illegal immigrants for the right reasons. #11 of course it’s all our fault. Heaven forbid anyone hold the Mexican government accountable. I’m never impressed with this argument. The American Indians took a rather more forceful anti-immigration stance than either the 1965 immigration act or the Arizona law provides for. They attempted genocide twice against the Jamestown settlers and twice against the Pilgrims, killing off between a quarter and a third of the population each time (including my 9X great-grandfather, fortunately after procreating). So as long as we stay substantially on the humane side of that reaction, I think we’re clear of the “hypocrisy” charge. No country in the world, as far as I know, has no restriction at all on who can come live there — even though every country in the world is likewise a “nation of immigrants” (or conquerors) if you go back far enough. I’ve said before that both Mexico and the U.S. would be better places, if President Polk had done what even some Mexican political figures urged on him in 1848 and annexed the whole of Mexico instead of just the Southwest. Agreed. Believe it or not, a high rate of immigrants in a city correlates with a relatively low crime rate. Unfortunately, many Latino immigrants’ kids often assimilate to “involuntary minority” American cultural folkways, arguably more so than previous immigration waves. Maybe it will all turn out for the good, like the Great Wave of Italian, Jewish and Eastern European immigrants a hundred years ago did. Or maybe not. We’re a less culturally self-confident country now than then (“who would want to assimilate into such a racistpatriarchaloppressivephallocentricheteronormative Amerika such as this?”), and there are some potentially important differences between mass, monocultural immigration from an immediate neighbor than from multiple cultures a great big ocean away. I’ve yet to get an answer, from a person who contends the Arizona law will lead to intolerable racial profiling, why the Arizona law will invariably lead to such profiling, whereas the federal immigration law (which is actually less restrictive on federal ICE agents than the Arizona law is on police officers) does not. The greatest sin of the Arizona legislature is not so much the content of the law (which its critics invariably haven’t read). It’s the mere act of doing anything, even symbolically, that suggests that mass illegal immigration is anything but an unalloyed blessing, or proposes to approach illegal immigration with any other attitude than (allegedly) benign neglect. That’s probably the best approach, although in this order: (1), (4), (3), (2). Any other order, we’ll just keep getting additional waves of illegal immigration, pushed by continued Mexican civilizational dysfunction and drawn by the prospect of the next “final” amnesty. Having lived and traveled around the world, I don’t think our laws are that draconian. If you wanted to permanently reside and work in most European countries, for example, it would be extremely difficult. If they caught you, you would get in trouble. Even as missionaries in Scandinavia, we had to register with the police department each time we moved. I think a fundamental purpose of any country is to secure it’s borders and protect its citizens. All that being said, there is obviously a need for the type of work that many people in the US won’t do. There are other people for whom this type of work is better than what they may otherwise be able to get. I think we need to reform our laws to allow this to happen. Perhaps, this Arizona law will ironically act as a catalyst for something more to be done. I do think the Church is being a bit “letter of the law” in this. They hide behind “no comment”. We talk about honoring the law. We talk about patriotism. We talk about honesty. We pay lip service to many things. But it seems we basically ignore it whenever we want. I do see both points, but I have a hard time supporting that a person whose whole presence in the US is based on a lie to be considered “honest in their dealings”. Maybe the church has decided that the moral imperative of making a decent life for one’s family is more important than the moral imperative of obeying US immigration law. I agree with Thomas on the order issues. People in America are for more likely to be compassionate toward the poor if elites, not having to compete for work with the poor or wait in emergency rooms for their care, start listening to the states who are being overwhelmed by the influx. I’m likely to rescue more people if people stop trying to paint me as racist until I save everyone on the planet. I’m a long way from Messiah status. This isn’t necessarily an LDS issue. I’d say that I favor what the state of AZ is doing. Illegal immigrants have broken the law. Yes, many of them are people escaping a bad situation for hope of a better life – can’t condemm that. Still, we have laws for a reason. To wink at them is to invite anarchy and a slap in the face to those that obey the law. We (USA) should “buy” or rather invade and topple the current Mexican government. It’s corrupt beyond belief. Not that ours is perfect, far from it. As long as the current oligarchy in power remains thus, Mexico will continue to export its poor. An invasion of Mexico could probably be wrapped up in a week (the 82nd Airborne would land and seize key points and the Airport in the DF, the 101st would follow up to reinforce, the Marines would land at Veracruz and Tampico like they did in 1914 to seize the oil fields and production facilities, the 2nd AD could roll out of Fort Hood and overrun Chihauhua in seventy-two hours, etc.) with darned few, if any, casulaties. The real question would be: WHAT TO DO WITH IT??? Still, Mexico would be far better off under American (especially American Hispanics) management than what they’ve got going now. I’m sure they’d welcome us a liberators. kuri – LOL! I do think that the US would pose a more formidable threat to the rampant drug cartels who have killed 23,000 Mexican citizens so far and seem far from justice. Plus, Mexico is prime real estate! Beach front, both coasts and an extra curlicue coast to boot! I also agree with Thomas’s ordering of the 4 solutions. What do you say, T – shall we draft some legislation? Hawk, I knew I liked you! I think this is the first thing I have ever read that is so close to my own feelings on the subject, although I had never thought of buying Mexico. Pure genius! It could be like Puerto Rico. I intensely dislike the border situation as it stands, but I am very much against any policy that penalizes desperate people who are so hardworking, sacrificing everything to try and give their children what they need. I am even more against policies that penalize the innocent children of illegal immigrants. As for all of the 13th Article of Faith arguments, yes, it is illegal to cross the border. It is dangerous and most of the people who do it do it out of desperation, not criminal intent. It’s a “transgression”, not a “sin”, people! I think we’re a bit past the Gentiles-scattering-the-Lamanites phase of history and probably closer to a seed-of-Lamanites-among-the-Gentiles-like-a-lion phase. We really need to deal with the illegal immigration issue with the best collective wisdom prayer and politics can find. I seriously doubt that. in my experience members (active mostly gop type members) are pro-Latinos as long as the Latinos stay in their Latino lands. US church members are though very friendly and helpful to Latinos who are in Latin-America and do hope their lives will improve there, in their homelands, imho ,from what I’ve seen. But also I’d say that the US has been very laxed towards immigration over the years. It shouldn’t be that hard to control who works in your country, other countries do it easily through the tax system. Actually its quit easy to do except for those working in the cash only economy. #6 “The reason your OP is outstanding is because you were a Missionary in Spain (the best of the best). Why would anyone want to annex Canada? A guest worker program is the most feasible option, methinks. Plus, it’s already been proven successful in the “Bracero” program of the 1950s and ’60s. I do think that the US would pose a more formidable threat to the rampant drug cartels who have killed 23,000 Mexican citizens so far and seem far from justice. That’s an easy problem to solve, actually: legalize marijuana in the USA. kuri – I actually agree with legalizing marijuana, which would reduce the drug trade, although harmful drugs would still be trafficked. Alex Hudson – I don’t see any way the national government CAN secure the border of AZ without billions of dollars they don’t have. Have you seen the AZ border? Friends of ours were ATVing in the desert and accidentally ended up in Mexico. There is no fence. There are intermittent posts with wide spaces in between. This isn’t a case of people scaling walls and barbed wire fences with manned watch towers. The main obstacle is the inhospitable desert terrain that stretches on and on. Which is supposed to keep people out, but doesn’t. The desire to be here is too much of a motivator. Strange as it seems, the murderous Mexican drug cartels that are ruining their country traffic mainly in marijuana. Illegal immigration has actually been falling since about 2005. Jeff – and the Sonoran desert stretches across a lot of AZ as well as Mexico, so whichever side of the border you live on, you’re in the same exact desert. So the cartels just move on to meth, heroin, cocaine, etc. What then? Legalize those drugs? The problem is, those can really work people over — even more than marijuana, which just makes you lazy, paranoid and stupid. The product liability for any legal manufacturer of meth would be crippling. They’d be sued into bankruptcy within a year, leaving the field to — the black marketeers, who can’t be sued. So we’re back with the cartels leaving headless bodies all over the desert again. Actually, portugal legalized everything, the cartels dissappered overnight, and drug use went down. Same thing happened with alcohol after the repeal of prohibition here in the US. It works, and has been shown to work. Most cartels would probably try to go legit. And I’d be fine with legalizing or at least decriminalizing those other drugs too. I’m sure the corporations that would handle them would quickly come up with enough money to buy protection from Congress and the courts, just like tobacco, alcohol, firearms, oil, coal and dozens of other harmful/dangerous industries do. Many other European countries have much more lax drug laws than we do — no more (or less) addicts and none of the horrific crime that we see associated with the drug trade. Over and over again we see that this simple idea works. Drug use declined under full decriminalization in Portugal. Portugal decriminalized personal possession of drugs. Trafficking is still illegal. And again, I would be cautious of the idea that “if the U.S. were to just adopt the policy of [fill in smallish, homogeneous orderly European country here], everything would be peachy.” The United States has cultural and demographic issues that make it different from most European countries. I strongly suspect that the criminal element in Mexico — a country founded by conquistadors, on the ruins of a civilization that liked ripping people’s hearts out — would find some other outlet for their imaginative violence. Kidnapping, for instance. The idea that drug-cartel warlords would turn into figures out of “A Walk in the Clouds,” strolling peacefully through rows of cannibis glowing through soft-focus mist-filtered sunlight, is something I’ve never quite been able to credit. Sure. Criminalization in America is a disaster. Decriminalization in Portugal didn’t increase drug use. It’s a data point. Take it for what it’s worth. I strongly suspect that the criminal element in Mexico — a country founded by conquistadors, on the ruins of a civilization that liked ripping people’s hearts out — would find some other outlet for their imaginative violence. Kidnapping, for instance. You don’t have much faith in capitalism. 😉 Drug cartel warlords want to make money. Legalized trafficking would give them an opportunity for easier, but less, money (since prices should fall with legalization). I think there would probably be enough easy money to convince them to try to stay in the same business. I’ve never had that idea. My idea is that they would be ruthless vicious scum. You know, just like other corporate CEOs. Careful there, you’d also get Justin Beaver for good! Maybe wikipedia can help out here. Wow, Thomas, I like to think that I’m offensive, but I’m going to have to go into serious training (I promise no doping) to come up with something as offensive as your comment # 41. Way to raise the bar. Oh, by the way, according to the GINI index–the indicator of how wealth is spread throughout a country, we’re more of an oligarchy (which is I think what you’re getting at) than Mexico. Besides, legalizing pot would immedialtely remove the need for Mexican violence to spill into the US, and have a host of other positive factors without (WITHOUT!!!!) raising the usage rate. See the Netherlands or Portugal compared to San Francisco for examples (actual peer-reviewed study.) As far as I can tell Pot was originally criminalized because black people liked to smoke it. Oh noes!!!!! Plus, have you seen the (painfully incomplete) drug studies done on MJ? It looks like the best anti-cancer drug we possess, but of course we can’t study it because if its current classification. You assume that people who want THAT much money ever stop? You, IMHO, underestimate the capability and irrationality of human evil. There are people who would consume the world, and then raise it again to build starships to find new life to conquer. CEO’s are not a moral class. Great good and great evil exisy in all social stratas, but the great evil is much more dangerous with more access to power. What, exactly, is untrue about my “offensive” comment? All countries and cultures are affected, to some degree or other, by their histories. Mexico has some truly harmful strains in its cultural history. Looking at its present and past dysfunction, I could either blame (1) some inherent inferiority of its people (I’m not going there), or (2) negative influences on its development. I go with #2. The GINI coefficient, standing alone, is irrelevant: The ways to wealth matter as much as does wealth itself. A commercial republic may allow the rich to get richer than they do under feudalism, but without remotely as much deadweight on the civilization’s development. The Pilgrims weren’t perfect, but if I had to pick cultural influences for a new civilization, I’d take their Weberian Protestant work ethic and congregational libertarianism over Latinate fatalism, Conquistador ruthlessness, Bourbon mercantilism, and Aztec vivisection. Michael Moore likes to think the Columbine killers were influence in part by General Dynamics building missiles in the area. That’s idiotic, but the basic point he’s taking to ridiculous extremes — that a culture’s overall attitudes towards violence can have an effect on how much violence occurs — isn’t entirely counterintuitive. Don’t forget to legalize meth while you’re at it. Legalization may affect the destructiveness of drug culture around the fringes, but it’s no panacea. Anybody notice that the gangs didn’t go away after the US repealed prohibition of alcohol? (prohibition didn’t create the gangs either; there are always predators among us, only the attack modes evolve to fit the environment It’s always an arms race between the herbavores and the carnivores. #32 (Hawkgrrl) – if you haven’t already seen it, get on YouTube and search under “Family Guy bag of weed song”. After seeing that sequence, you’ll never watch “Chitty Chitty Bang Bang” with a straight face again! Amen to legalization. Legalize, regulate (ATF, would that have to be now ‘ATFM(arijuana)’,’ATFP(ot)’, or ‘ATFW(eed)’ ? ), and TAX. Municipalities decrying the loss of sales tax revenue due to closure of ‘brick-and-mortar’ establisments can now see them re-open as head shops! Of course, just TRY to advocate a pro-legalization stance in a HP group meeting under the principle of free agency! That’s a guaren-darned-teed way to earn poisoned looks from the older brethren! It’s a sad commentary on the current Central government as opposed to ‘Federal’ government that we had prior to the “War of Northern Agression” (what YA’LL Yankees improperly term ‘Civil War’, we Suthunuhs didn’t find it terribly civil, folks!) that when one of its constiuent states takes upon itself to actually enforce ‘Federal’ law, the same ‘Federal’ “Gubmint” takes action to not only avoid enforcing its own laws but crusades against the erstwhile “rebellious” state! Folks, is it 12/20/1860 (Ft. Sumter) all over again? It’s comedic to listen to many self-styled ‘conservative’ members ASSUME (and we all know what ‘assuming’ makes of “U” and “Me”!) that their politics are an extension of LDS doctrine! I still cringe at much of the acrimony directed at Brother Harry Reid. Hey, I don’t care for a great deal of his politics either, but I’m not in any position to judge his faithfullness as a Church member. I’m glad he’s got a thick hide. A good friend and convert of 13 years ran for Congress (CA 3rd district) a few terms ago as a DEMOCRAT…the first time in many years that I voted for (in futility in a district 70% Republican) one of the “donkeys” but, hey, the man is savvy, moral, and hard-working. Gee, I actually looked beyond the party labels and voted for the candidate I considered to be best qualified! Buy Arizona…(and not just the sugary drink)…or vacation there this year! We have had it so easy in America in the last several decades, that we don’t even realize when we need to take action before it is too late. The violence and lawlessness in Mexico is coming across the border every day, not to mention Islamist radicals. The solution for Americans is to first secure our own country against this mess. Anyone think BARACK is going to tackle this? Thus, Arizona and other states are left to fend for themselves. The good people of Mexico need to have the backbone to take back their lovely country from the thugs who are now running it. Didn’t we have to fight for liberty here? America has its own problems right now and can’t solve everyone else’s problems by taking them in. We can’t afford all of the illegal immigrants, and they don’t belong here if they’re illegal, no matter how nice they may be! Take back your own country, Mexican people! Take courage and ask the Lord to help you in your efforts to fight against wickedness and corruption! We Americans have our own battles to wage against wickedness and corruption in our land, Lord willing, and it is very urgent!